Ideal Meal team members (left to right) Rebecca Porto, Kevin Chung, Maria Barto, and Alex Harmon, stand with i-Dry team members Aubrey Benito, Alyssa Puccia, Tiana Noud and Max Arakelian, after being awarded a combined $30,000 at the end of the District 211 Pitch Night May 15, 2018. Nearly 200 parents, students, and community members gathered in the auditorium at James B. Conant High School, May 15, for the third annual District 211 Pitch Night. During the evening, teams from throughout the District pitched business ideas and products to a panel of area business leaders with the intention of gaining funding. By the end of the night the panel of investors chose to invest $30,000 in teams Ideal Meal from William Fremd High School and i-Dry from Palatine High School. Top money maker Ideal Meal, made up of Fremd Seniors Maria Barto, Alex Harmon, Rebecca Porto, and Kevin Chung, received a $20,000 investment to further develop their website and eventual app which would allow patrons to search for restaurants based on food allergies, dietary restrictions or dietary preferences. They opened their pitch by discussing personal experiences of watching friends and family with food allergies suffer while trying to visit local restaurants. 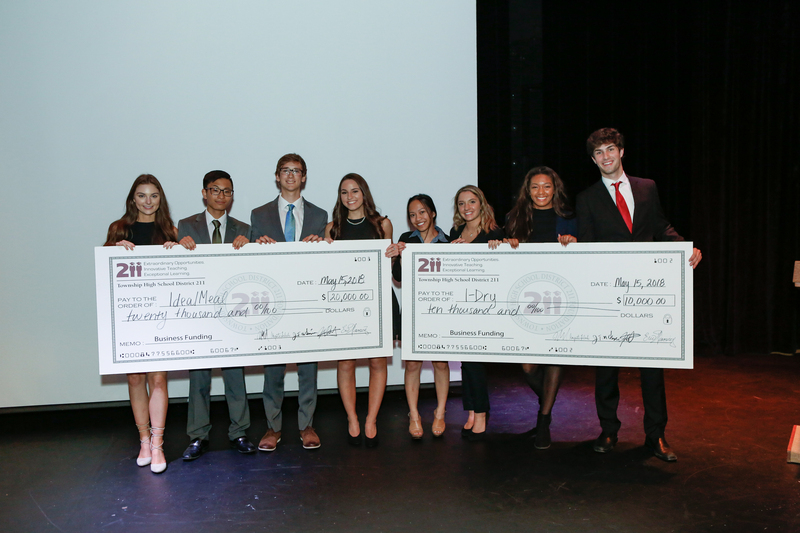 Palatine High School’s i-Dry, which was comprised of seniors Alyssa Puccia Aubrey Benito, Tiana Noud, and Max Arakelian, received $10,000 to further develop their product which is designed to combat water damage to cell phones. The team opened their pitch with humorous anecdotes of how they were inspired by the accidental destruction of each of their own phones. The Pitch Night is the culmination of the District’s Business Incubator program. The program, which is active in all five District 211 schools, pairs teams of students with area business leaders and entrepreneurs to help them discover problems and build complete business models to create a marketable solution. Patti Ertl, Conant High School Business Education Department Chair, said the pitch night was a success due to more than 100 community volunteers. She added that the Incubator teachers from each school were already working on next year’s Pitch Night. Other ideas pitched to the investors included NoPack, a case and stand to hold tablets wile including storage space for cords and accessories, sPark, an app which would allow the user to reserve parking in crowded parking lots, and Press Fit, which designed a compression brace for athletes. 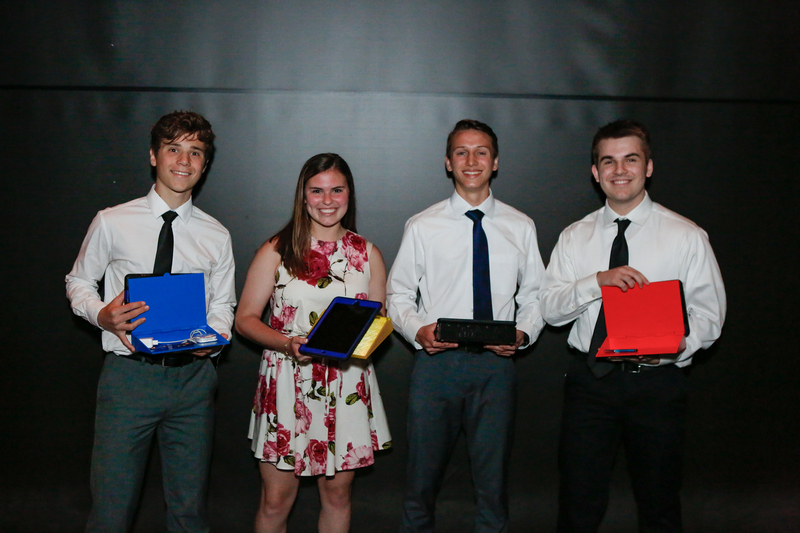 Conant High School seniors Jake Cosentino, Betsy Riley, Sebastian Frank, and Mark Frale show off NoPack, a tablet stand and storage case they designed and pitched during the District 211 Pitch Night May 15.